I promise not to write a post about the "Winter With the Steel Grip" that is still with us. I prefer to focus on the longer days and that January is almost over Thanks Heavens. And butterflies. I am thinking about butterflies. Yes Virginia, there will be butterflies again and mosquitoes. 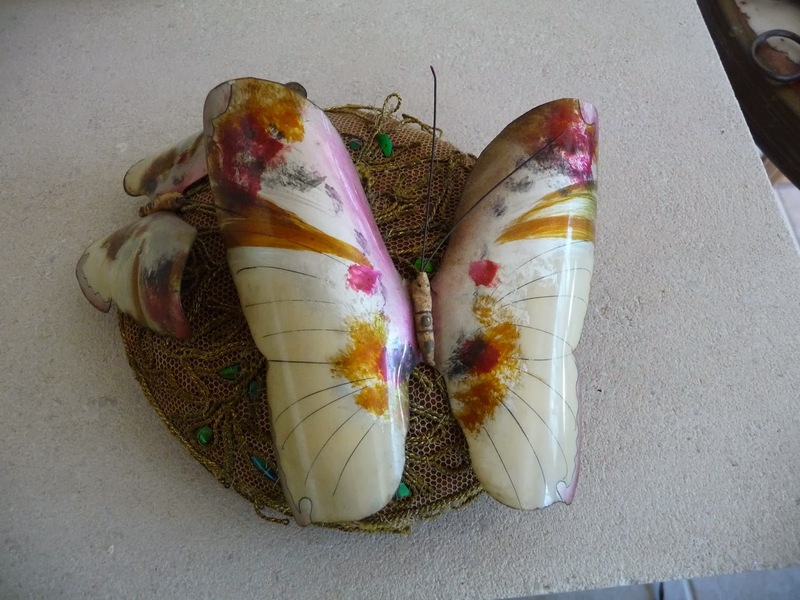 I have some vintage butterfly antiques, but not mosquitoes such the pity. 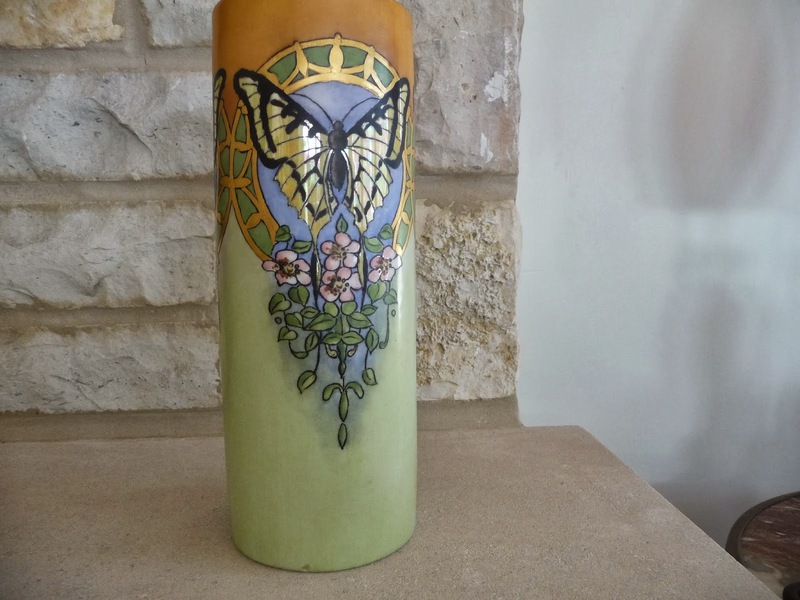 This lovely vase was purchased years ago in a pick around little shop in rural Kentucky. Beautifully hand painted with 14K highlights. Great tiger swallowtail. It is a keeper. One of our Forever Keepers. 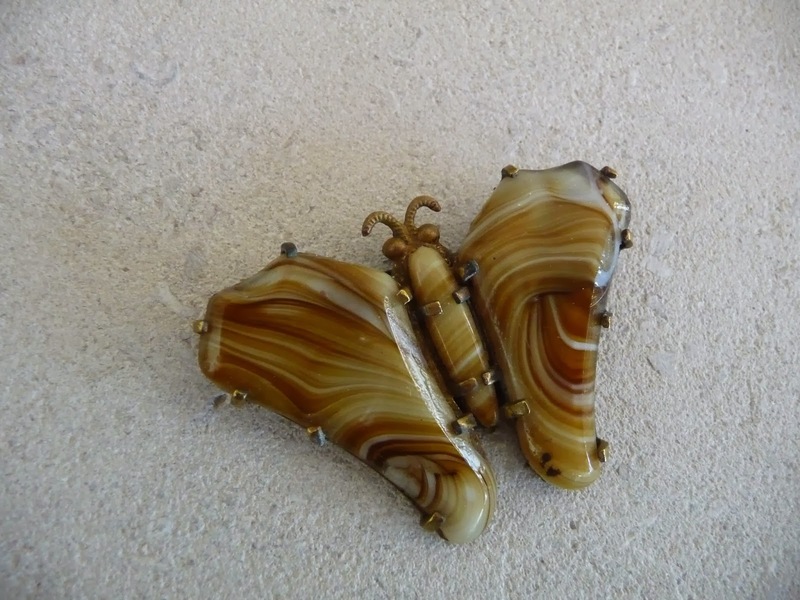 This lovely agate vintage butterfly brooch was purchased in Prague. Dear Husbola knows I love bug and insect pins. Probably about 1900 by the style of the clasp. Love it. It is a keeper too. 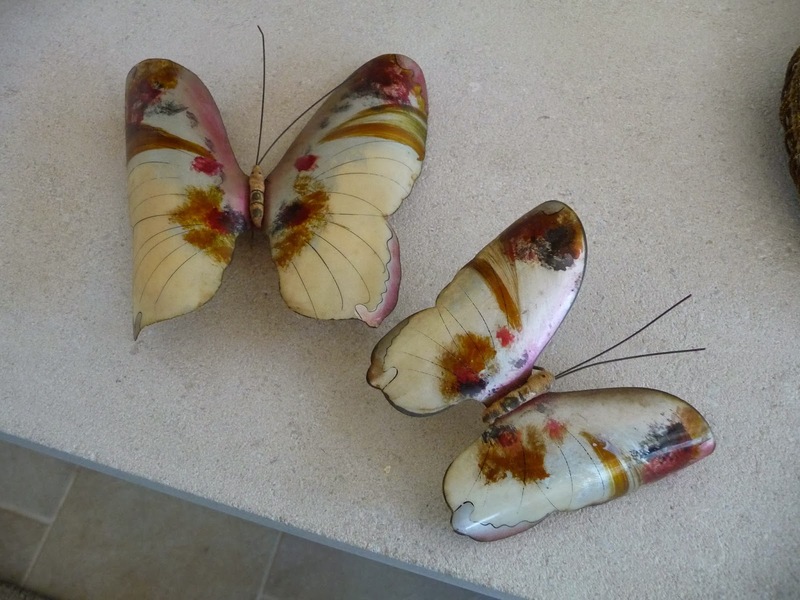 These are incredible handpainted celluloid butterflies that I bought on a buying trip to England years ago. I think they came from a fair in Shepton Mallett in the west country of England. They are beautifully detailed and sit via pins on a handmade lace pin cushion. One of those "Had To Have Them Never To Sell Them" kind of things. There are many things in our home that we live with for awhile and then sell on. Not my butterflies. If I run into any mosquito collectibles, I'll let you know because THOSE will be for sale. 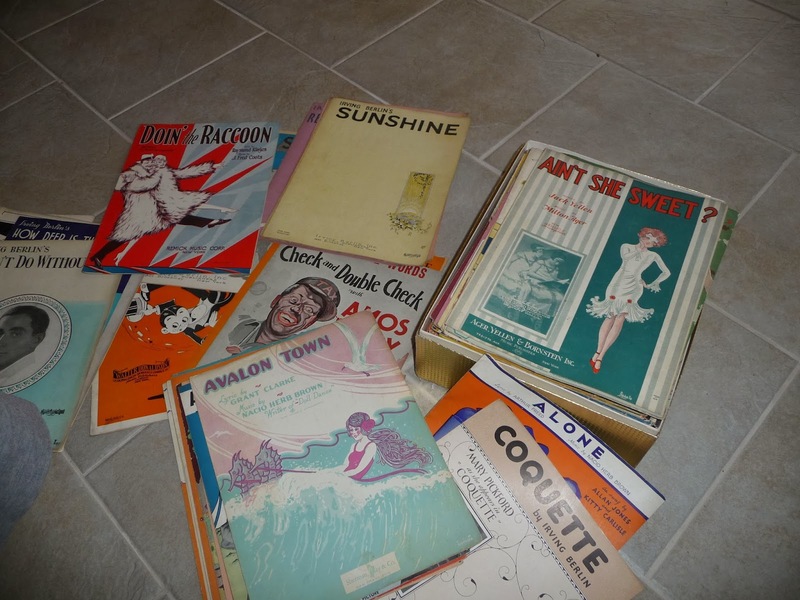 Vintage sheet music is a relatively inexpensive items to collect. 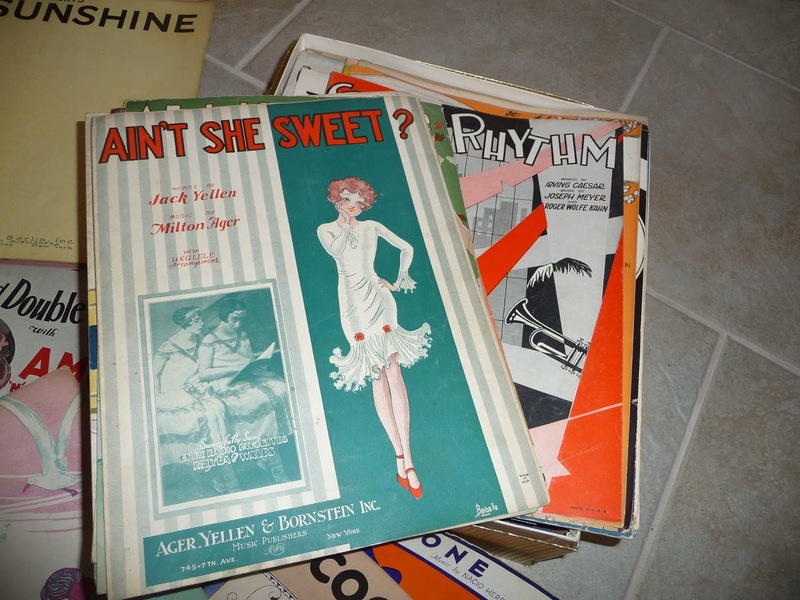 Nothing traces our American history and follows the trends of our country and society better than old sheet music. 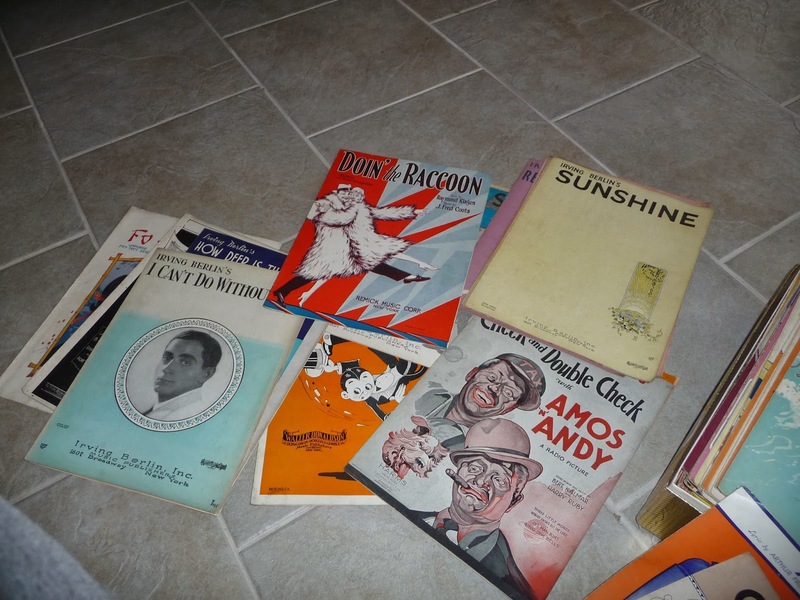 Dear Husbola and I recently attended an auction where one of the lots was about 40 pounds of sheet music. Really-yes--hundreds of sheets in a giant pile. I decided it was a good investment as it is easy to sell on ebay and the markup will make a good return. The pile is full of great condition pieces--which is very important to collectors--and many unusual pieces. The artwork is remarkable--it was made to catch the buyer's eye. Some are just adorable and would be great framed. Thank heavens for some freezer forethought in early September last year. January is "eat everything out of the freezer" month at our house. You just never know what will be uncovered in the bottom of the drawer. This month's digging has uncovered packages of frozen artichokes, pearl onions, bison meat, leftover containers of chili that were frozen from the "bottomless pot" that was cooked in late winter. 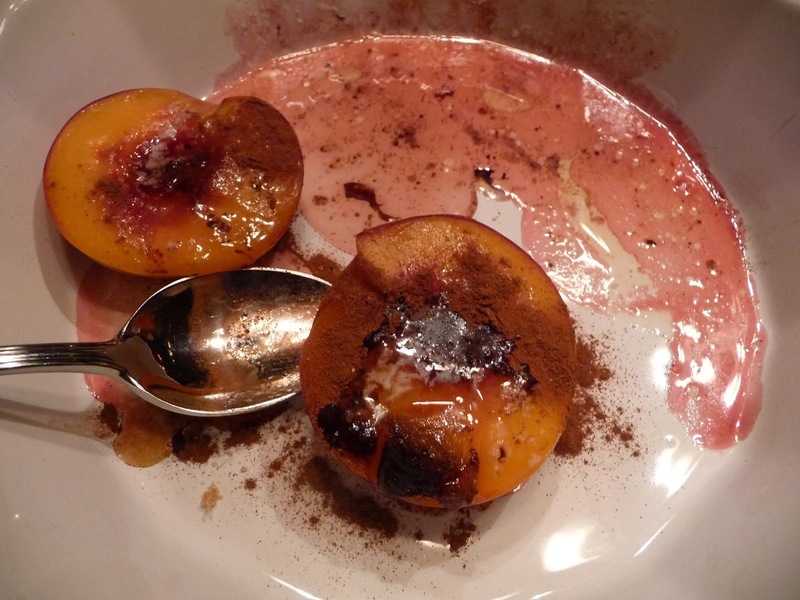 And thankfully--a ziplock bag of frozen peach halves. In my late summer over exuberance of farm stand purchasing--I purchased way too many fresh peaches. They all seemed to ripen at the same time--and I had no clue what to do with them all. So I simply sliced them in half, removed the stones but left on the skin and chucked them into a ziplock bag and popped them in the freezer. Yesterday during Green Bay Packer half time--I found them. Fill each stone indentation with a pea size piece of butter, teaspoon of brown sugar, small small pinch of salt and healthy shake of cinnamon. Bake at 350 uncovered for 18-ish minutes. 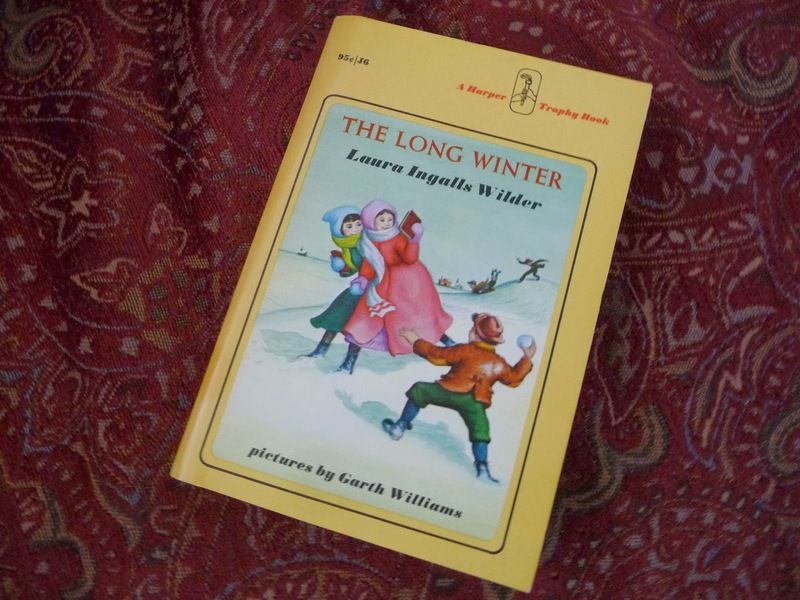 Whilst cleaning and sorting during the inside days "of the winter that will never end", I came across my vintage set of Laura Ingalls Wilder books. As a child, I gobbled up this set of books and could not wait to read the next chapter about Laura and Pa and Ma and Mary and Carrie and eventually Baby Grace. This was waaaaaaay before the television series that decided Michael Landon was the Perfect Pa. I remember being riveted to Laura's adventures and vivid way the pictures of her life danced in my head. I even asked my mother to make me a Pioneer Lady dress. I spent many wonderful summer days dragging my coaster wagon around the yard like a prairie schooner and "played pioneers" under the apples trees at Parsonage #2. "On the empty winter prairie, gray clouds to the northwest meant only one thing: a blizzard was seconds away. The first blizzard came in October. It snowed almost without stopping until April. The temperature dropped to forty below. Snow reached the rooftops. And no trains could get through with food and coal. The townspeople began to starve. The Ingslls family barely lived through that winter. And Almanzo Wilder knew he would have to risk his life to save the town." My series of books is from 1971. 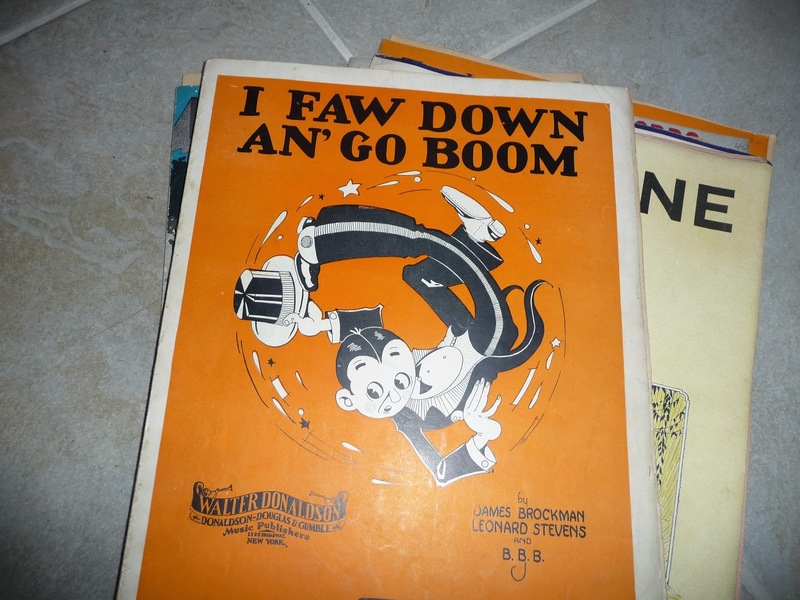 If you ever find a vintage copy of any of the series--snap it up. A good read--whatever your age. Regular readers to this blog will remember that I look at the start of a new year as a good excuse to evaluate our collections of antiques and vintage and fine tune our "keepers" and "sellers." The very best part of being an antique dealer is the thrill of the hunt. Yes--the hunt for items to sell but a big part for Dear Husbola and me is the ability to add to and update the items in our home. When we find a keeper, it means something is plucked from our house to sell. All the January magazines give a million suggestions of how to divest yourself of clutter and no longer wanted or useful items. The smartest advice I have seen breaks it down very simply. As you clean and sort ask yourself an easy question about each item--Do I use it?? Do I love it?? Do I need it???? One additional criteria of letting go could be if you don't remember where you got it-time to let it go. Or for clothes, if the last time you wore it, Jimmy Carter was president, DEFINITELY time to let it go. The next few days are serious stay inside weather days in Northern Illinois. Great time to tackle that drawer or piece of a room and fill a box or bag for the Salvation Army store. Only 8 percent of people have kept their New Year's resolution by the end of the month. Evaluating our collections is an easy one to keep. Adieu Belle Dame.... View from the beautiful blooming park behind the cathedral. Near Chicago with 1000 trees, and several bee hives and too much crabgrass--but never mind. Dear One and I have been selling antiques in the Midwest since 1989. We enjoy poking around shows, flea markets and auctions to find quirky items to sell. 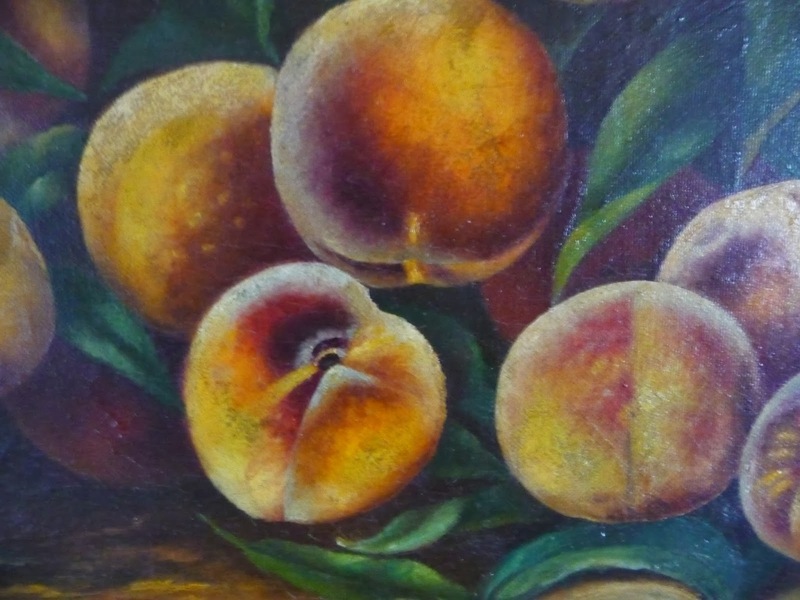 Paintings, unusual furniture and good mid century decorative arts find their way into our shop and to shows. We sell at Odana Antiques in Madison Wisconsin. We do a few shows a year including the Elkhorn Wisconsin Antiques Market and have added the fabulous Midwest Antiques Show in Cedar Rapids Iowa in spring and autumn. I enjoy trying new recipes and am addicted to farmers' markets. You will find us always out and about looking for the unusual decorative items for clients--but not when the Green Bay Packers are playing or there is something interesting going on at church. Visiting Madison Wisconsin Area for Antiques?? 6201 Odana Road, Madison Wisconsin. Exit Madison 12/18 west. Take Whitney Way exit right one block to Odana Road and turn left. One mile-ish the mall is on your right. LARGE. 608/278/7892. Open 7 days a week and hours vary.